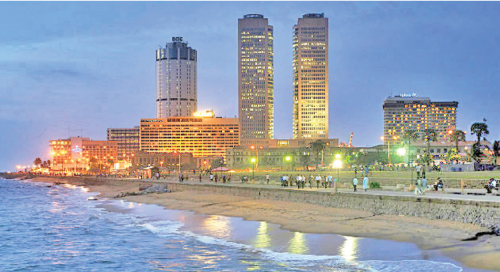 Home A balancing act: Can Sri Lanka overcome regional income inequalities? Although Sri Lanka has managed to reduce income poverty from 26.1 per cent in 1990/91 to 4.1 percent by 2016, income inequality has remained unchanged for more than four decades. The richest 20 per cent enjoy more than half the total household income of the country, while the poorest 20 per cent get only 5 per cent. The situation of the poorest 10 per cent of the households is worse, with the share of household income being just 1.8 per cent or less. Furthermore, income gaps between different regions are even wider than the income inequality at the national level. Recognising the importance of reducing these income gaps, the 2030 Agenda of the Sustainable Development Goals (SDGs) has given high priority to curbing inequality, both as a standalone goal as well as a cross-cutting issue. The success of most of the SDGs will depend on reducing all forms of inequalities. For instance, the eradication of poverty in all its forms is intrinsically linked to inequality, as a more balanced and equitable distribution of a country’s economic and environmental resources is a crucial component of poverty alleviation. Given its importance, this blog focuses on regional income inequalities in Sri Lanka, based on the Household Income and Expenditure Survey (HIES), 2016, conducted by the Department of Census and Statistics (DCS). Households receiving a monthly income of Rs. 81,372 or more (in the richest 20 per cent in the National Household Income Deciles (NHIDs) scale) are considered the ‘richest group’ in this analysis. 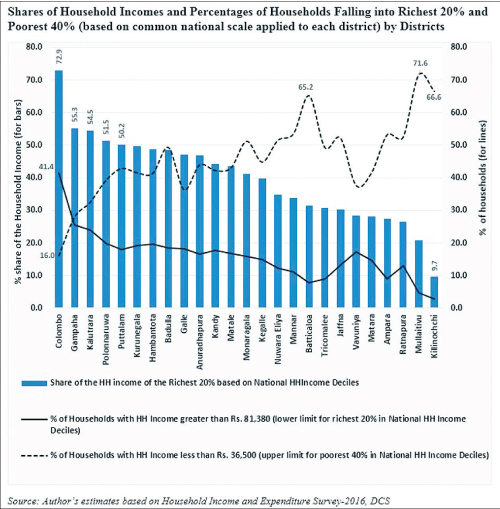 The households receiving less than Rs. 36,500 (in the poorest 40 per cent in the NHIDs scale) are considered the ‘poorest group’. Using these common national-level scales allows for a comparison of household income distribution in each district, relative to the corresponding household income distribution at the national level. The graph gives the shares of Household Incomes and Percentages of Households falling into richest 20 percent and poorest 40 percent in each district, based on this common national scale. 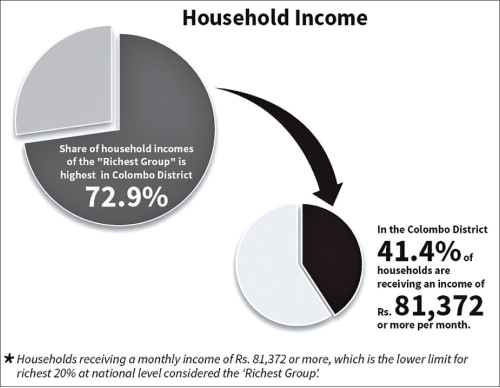 As observed, in the Colombo district, the ’richest group’ enjoys 72.9 per cent of the district’s total household income. More than 41 per cent of the households in this district are in the ’richest group’, with a monthly income of Rs. 81,372 or more. The other districts with a high share of household income enjoyed by the ’richest group’ are Gampaha (53.3 per cent), Kalutara (54.5 per cent), Polonnaruwa (51.6 per cent) and Puttalam (50.2 per cent). The highest percentage of households falling into the ‘poorest group’, with a monthly household income of less than Rs. 36,500, is in the Mullaitivu district (71.6 per cent) followed by Killinochchi (66.6 per cent) and Batticaloa (65.2 per cent). On the other hand, only 16 per cent of households in the Colombo district fall into the ‘poorest group’. But in absolute terms, Colombo has more than five times the number of households in the ‘poorest group’ compared to the corresponding number in Mullaitivu. It should also be noted that in districts such as Mullaitivu, Killinochchi, Mannar, and Vavuniya, the shares of the households in the ‘poorest group’ out of the total in Sri Lanka, are extremely small (less than 1.0 percent), although the percentages within each of these districts are high. As such, it is important to consider both the percentage as well as the absolute number of households with very low levels of income, when taking any action to improve the living conditions of people living in poorer households, to prevent leaving anyone behind. Inadequacy of opportunities in predominantly rural districts in Sri Lanka is one of the main reasons for the significant gaps in income levels among regions. 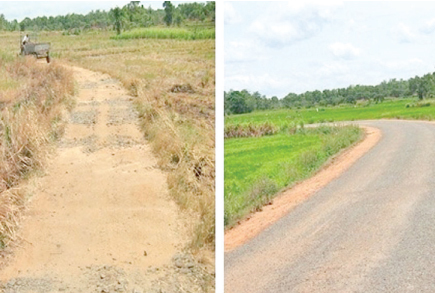 The main contributing factor for this is the inadequacy of infrastructure facilities, especially connectivity between remote rural and estate areas and the urbanised areas, where there are more opportunities for employment, higher quality education, better health services, and increased access to public services. Another important factor is the inadequate attention given to the agricultural sector; 27 per cent of the employed population are engaged in agricultural activities and nearly 30 per cent of the moderately poor (based on global poverty line of US$3.20 a day) are living in households headed by those engaged in agricultural activities. In rural areas, the majority depend on agriculture. Many of them are also affected by frequent natural disasters, especially floods and droughts. As such, if adequate attention is not given to these issues, it would be difficult to reduce the prevalent spatial income inequality in Sri Lanka. Another reason for the persistent income inequality is the low female labour force participation in Sri Lanka (only around 36 per cent), especially in rural areas. This is mainly due to the inadequacy of decent employment opportunities in their villages. Weaknesses in targetting the most deserving in the social protection programmes also adds to this prevailing undesirable situation. The imbalances in opportunities and wide gaps in income levels, as well as in living conditions, among regions and between the rich and the poor, need to be addressed immediately. Sri Lanka needs to ensure an inclusive growth process which yields broad-based benefits to all, by providing equitable access to economic participation among all citizens, particularly aiming at improving the livelihoods of the poorer 40 per cent of the households. It is also vital to provide access to quality education for all children. Greater investment in skill development is important, as the demand for skilled workers increases with technological advances. The agriculture sector needs special attention to reduce the spatial inequality, as most of the people in the less-developed regions in Sri Lanka depend mainly on agriculture and produce food for 21 million people in the country. This should not be disregarded when developing strategies to reduce spatial income inequalities.